Researchers at Stanford University’s Virtual Human Interaction Lab strapped 69 student volunteers into an immersive, 3-D virtual-reality rig, where test subjects found themselves sitting across the table from a “digital agent” — a computer-generated man or woman — programmed to deliver a three-minute pitch advocating a notional university security policy requiring students to carry ID whenever they’re on campus. The anthropomorphic cyberhuckster featured moving lips and blinking eyes on a head that nodded and swayed realistically. But unbeknownst to the test subjects, the head movements weren’t random. In half the sessions, the computer was programmed to mimic the student’s movements exactly, with a precise four-second delay; if a test subject tilted her head thoughtfully and looked up at a 15-degree angle, the computer would repeat the gesture four seconds later. For the other half of the participants, the program used head movements recorded from earlier students, ensuring they were realistic but unconnected to the test subject. The results, to be published in the August issue of the journal Psychological Science , were dramatic: Only eight of the subjects detected the mimicry (one of them falsely). The remaining students liked the mimicking agent more than the recorded agent, rating the former more friendly, interesting, honest and persuasive. They also paid better attention to the parroting presenter, looking away less often. Most significantly, they were more likely to come around to the mimicking agent’s way of thinking on the issue of mandatory ID. Since World War II, our economy has evolved in ways that reinforce the financial differences between strong families and weak families. As the earnings of women have risen, “assortive mating” (men and women of similar educational levels tending to marry) tends to widen income differences. The surge in entrepreneurship further rewards strong families. Finally, the rise in divorce and single motherhood puts severe stress on the lower part of the income distribution. Consider how differently the public treats physics and economics. Physicists can say that this week they think the universe has eleven dimensions, three of which are purple, and two of which are twisted clockwise, and reporters will quote them unskeptically, saying “Isn’t that cool!” But if economists say, as they have for centuries, that a minimum wage raises unemployment, reporters treat them skeptically and feel they need to find a contrary quote to “balance” their story. In the most frightening of the recent episodes, a rogue sea lion bit 14 swimmers this month and chased 10 more out of the water at San Francisco’s Aquatic Park, a sheltered lagoon near the bay. At least one victim suffered puncture wounds. Some scientists speculate that the animals’ aggressive behavior is being caused by eating fish contaminated by toxic algae, or by a shortage of food off the coast. But wildlife experts say even healthy sea lions are best left alone. In Southern California in June, a sea lion charged several people on Manhattan Beach and bit a man before waddling into the water and swimming away. In Berkeley, a woman was hospitalized last spring after a sea lion took a chunk out of her leg. Last year, a group of sea lions took over a Newport Beach marina and caused a vintage 50-foot yacht to capsize when they boarded it. And a lifeguard in Santa Barbara was bitten three times while swimming off El Capitan State Beach. In Alaska, a huge sea lion jumped onto a fisherman’s boat in 2004, knocked him overboard and pulled him underwater; he escaped without serious injury. 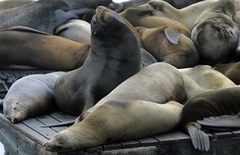 Sea lions, which can reach 1,000 pounds, typically bite only if they feel threatened or cornered. And they are more likely to flee than fight if they can escape. Researchers have described the most recent attacks, in which some swimmers were chased through open water, as abnormal behavior. Still, with a population numbering about 200,000 and growing, these playful, social creatures are increasingly likely to cross paths with humans. Researchers using new positional MRI machines have concluded that sitting straight is ‘bad for backs’. Leaning back slightly is better. The popular mythology of Women’s Liberation regards it almost entirely as a political movement. And yet there is no other historical movement so completely economically determined. Labour saving appliances have reduced the amount of housework that must be done. The first point is obvious, though often overlooked: so long as muscle and speed were important job qualifications, there were almost no jobs that women could do better than men; in consequence, they were inevitably at an economic disadvantage. And the second is shamefully neglected, possibly because almost no one has any idea just how hard a woman’s work was, before the invention of modern conveniences. Feeding, clothing, and sheltering a family was a full time job; given the demands of pregnancy and infant care, and their competitive disadvantages in the labour force, it is not reasonable to imagine that anyone but women was going to do that job. There is a reason that sufragettes were relatively wealthy women: they had servants to take care of their homes. Airtight packaging has saved hours of time grinding coffee (by hand), shelling nuts, chopping chocolate, baking bread (or buying it at the bakery), cleaning fish . . . the list goes on and on. It also makes it possible to buy things in bigger lots, saving shopping time. Undoubtedly readers could come up with other, equally critical devices, to add to the list. But the point is that in the 1930s, almost no one imagined that all these worthless, decadent consumer goods had the power to revolutionize gender relations. Aldous Huxley thought we’d have to invent increasingly equipment-intensive games to use up all our excess production; George Orwell envisioned a world permanently at war to destroy these dangerous goods; John Kenneth Galbraith foresaw corporations tricking consumers into buying all their useless geegaws through slick advertising. The reality was that for the first time in history, an average Western woman could have her own family, and her own home, and still have a career besides cooking and cleaning for them. We are no doubt similarly blind to the people who might be empowered by economic revolutions still to come. How can we possibly declare that the things we don’t now know that we want are morally unimportant, when we don’t even know what those things are? Eberhard is that unsung breed of Silicon Valley genius: the hardware engineer. I crossed paths with him briefly 15 years ago when we both worked for a startup that made computer workstations. It was obvious he was the company’s secret weapon. He went on to launch one of the first e-book readers, then used his buyout money to build electric cars. 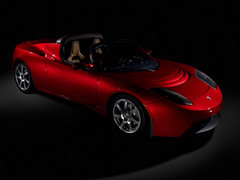 Tesla operates more like a consumer-electronics maker than a traditional auto manufacturer. The company’s headquarters are in the Valley, where a team of designers creates specs for parts that are manufactured and assembled around the world. The first batch of cars is being assembled in England by Lotus, a small-volume sports-carmaker. Eberhard says traditional carmakers have failed with electrics for two reasons. First, they market them as “penalty boxes” for environmental do-gooders and gas-mileage-obsessed penny-pinchers. Second, they just don’t understand batteries. The Tesla’s giant lithium-ion battery pack gives it the power to hit 60 in four seconds, to run 250 miles without a recharge, and to charge rapidly at its home charging base (a one-hour charge will take you 80 miles; it takes a 3.5-hour charge to go 250 miles). You can even plug into a wall socket at a roadside stop in a pinch. That makes the Roadster a viable commuter car and weekend day-tripper. The company claims energy costs as low as a penny per mile. The two-seat debut model, a $100,000 pop-top sports car about the size and shape of the Lotus Elise, has room for two people and a set of golf clubs but not much more. Tesla is working on a 2009 model aimed at competing with BMW’s 5-series, a $50,000 to $75,000 sedan with room for five adults and a full-sized trunk. It may also license the electric-motor tech to other carmakers—an all-electric Prius isn’t out of the question. He notes that the primary object in a small war is to force insurgents to fight on the regular force’s terms by drawing them into conflicts in which their superior firepower and discipline could prevail. Unfortunately, the history of small wars has shown that insurgents play hit and run — striking boldy and then retreating quickly, and rarely engaging the larger force head on. The other, and much bigger obstacle to winning small wars, brings a moral dilemma. According to Callwell, to win small wars, mere victory isn’t enough, the enemy must be thoroughly and utterly destroyed to the last man, woman, and child — which means enormous civilian casualties. For citizens of most modern democracies, this is an unacceptable stance. The level of violence and barbarism it would take to beat an insurgent force — torture, wholesale executions, leveling of towns — is a place where most democracies refuse to go. This keeps victory out of reach. Small wars are also lost because of the larger army’s lack of national commitment which ends in inadequate or misspent funds and deployment of too few troops. For insurgents fighting for their own soil, the commitment is 100 percent. If they lose the war they lose everything. Without ‘skin in the game’ national commitment by the larger force’s country usually wanes. In fact, women talk almost three times as much as men, with the average woman chalking up 20,000 words in a day — 13,000 more than the average man. Of course, it’s not easy to program a game’s AI to learn from experience as well as humans do. Two German scientists, Dr Gerhard Knies and Dr Franz Trieb, calculate that covering just 0.5% of the world’s hot deserts with a technology called concentrated solar power (CSP) would provide the world’s entire electricity needs, with the technology also providing desalinated water to desert regions as a valuable byproduct, as well as air conditioning for nearby cities. Just “0.5% of the world’s hot deserts” sounds pretty small, but, of course, it’s not. Desert land is cheap though. There are different forms of CSP but all share in common the use of mirrors to concentrate the sun’s rays on a pipe or vessel containing some sort of gas or liquid that heats up to around 400C (752F) and is used to power conventional steam turbines. Note that these impressive efficiencies only come about if you manage to use the shade and the desalinated water for horticulture and the cold water for air conditioning — with no additional inefficiencies. The German reports put an approximate cost on power derived from CSP. This is now around $50 per barrel of oil equivalent for the cost of building a plant. That cost is likely to fall sharply, to about $20, as the production of the mirrors reaches industrial levels. It is about half the equivalent cost of using the photovoltaic cells that people have on their roofs. So CSP is competitive with oil, currently priced around $60 a barrel. Dr Knies says CSP is not yet competitive with natural gas for producing electricity alone. But if desalination and air conditioning are added CSP undercuts gas and that is without taking into account the cost of the carbon emissions from fossil fuels. [T]he reports recommend a collaboration between countries of Europe, the Middle East and Africa to construct a high-voltage direct current (HVDC) grid for the sharing of carbon-free energy. Alternating current cables, which now form the main electricity grids in Europe, are not suitable for long distance transport of electricity because too much is lost on the way. Dr Trieb, of the German Air and Space Agency, says the advantage of DC cables is that the loss in transport is only about 3% per 1,000 kilometres, meaning losses between North Africa and Britain of about 10%. Low voltage is convenient for customer loads such as lamps and motors. Early electric power distribution schemes used direct-current electrical generators located near the customer’s loads, which distributed power at the same voltage as the lamps and motors needed. As electric power became more widespread, the distances between loads and generating plant increased. Since the flow of current through the long wires resulted in a voltage drop, it became difficult to regulate the voltage at the distribution circuit extremities. Customers near the generator would have a higher voltage than those at a distance. This was undesirable because lamp life was reduced by excess voltage, and performance of motors was reduced by low voltage. For a given quantity of power transmitted, higher voltages reduce the transmission power loss. Power in a circuit is proportional to the product of voltage and current, and the power lost as heat in the wires is proportional the square of the current. So, higher transmission voltages increase the efficiency of transmission, for a given size of conductors. Another way to reduce transmission loss is to increase the size of conductors, but since the cost of wires is approximately proportional to their weight per unit length, this strategy becomes un-economic. The principal advantage of AC is that it allows the use of transformers to change the voltage at which power is used. With the development of efficient AC machines, such as the induction motor, AC transmission and utilization became the norm (see War of Currents). Manipulation of DC voltages is considerably more complex, and has only become economically feasible with the development of high power semiconductor devices: Thyristors, IGBTs, MOSFETS, GTOs, etc. Dr Richard Toye, a history lecturer at Cambridge University, has discovered that the phrase “the gathering storm” — used by Churchill to describe the rise of Nazi Germany — had been written by Wells decades earlier in The War of the Worlds , which depicts an attack on Britain by Martians. Dr Toye also identified similarities between a speech Churchill made 100 years ago and Wells’s book A Modern Utopia , published in 1905. Wells wrote A Modern Utopia in 1905. The book was an attempted update of Thomas More’s Utopia , which championed radical ideas including basic state support for citizens. Churchill, then a junior minister in the Colonial Office, did not get around to reading it until his holidays the following year. Two days after writing to Wells, Churchill gave an address to the Scottish Liberal Council in Glasgow in which he said the state should support its “left out millions”. Historians now regard this as a landmark speech of Churchill’s career. In 1908, Wells supported Churchill when he stood in a by-election for the seat of Manchester North-West. This, evidently, was a period in which the term “liberal” shifted meaning. Like Wells, Churchill said the state should support its citizens, providing pensions, insurance and child welfare. Wells entitled his book A Modern Utopia. Churchill, two days after expressing his “debt” to Wells, described his own vision of the supportive state as a “Utopia”. Wells advocated the idea of selective breeding, arguing that people should only be able to have children if they met certain conditions such as physical fitness and financial independence. Churchill told Wells he particularly admired “the skill and courage with which the questions of marriage and population were discussed”. Churchill was then described by a friend as “a strong eugenist”. Wells predicted the political unification of “the English-speaking states” into “a great fed eration of white English-speaking peoples”. Churchill often argued for to the “fraternal association” or “unity” of the English-speaking peoples, and even wrote a four- volume history of the English-speaking peoples. The acronym “BASE” was coined by film-maker Carl Boenish, who in 1978 filmed the first jumps from El Capitan to be made using ram-air parachutes and the freefall tracking technique, which effectively defined modern BASE jumping. The World BASE Fatality List records 104 deaths from BASE jumping, typically by wall or cliff strike, often by equipment malfunction, and sometimes simply by impact.